Patnitop or Patni Top is a hilltop tourist location in Udhampur district in Jammu and Kashmir state of India on National Highway 44 112 km from Jammu on the way from Udhampur to Srinagar. One reaches Nathatop after a short trek from Patnitop. The hill station is covered with snow during winters thereby enhancing its beauty two times. One can happily go skiing in these mountains. Nathatop has become very famous for its paragliding and sometimes people from different parts of the country travel to experience the beauty and these experiences offered by the place. One gets an excellent and clear view of the Himalayas from the peak of these hills. It has an altitude of about 2711m. Nathatop has a variety of roadside food vendors who sell yummy delicacies to fill the bellies of the visitors coming there. It has a pleasant climate and is fun to hang out at. It is a must-visit place for the nature lovers and those who love to sit quietly at one place and enjoy the serenity of a place. It is a peaceful place away from the fast moving lives of the city. Pir Panjal Mountains, when visited during winters, are filled with snow all over and are a treat for the eyes! Snow is replaced by lush green grass in summers. Patnitop is a hilltop tourist destination offering a paragliding joyride perched at an altitude of 2024 m above the sea level. The ride is conducted at a 2 km landmark, Dawariyai, situated on Patnitop-Sanasar Road, also known as Billoo Di Powri point. One can reach the point by ascending through 400 plus steps carved out of rock. The organizers, apart from providing safe and thrilling ride, also offer a good quality video. After a flight of about 7-15 minutes, depending upon the wind conditions, you will land at Kud, all excited and enchanted. Winter months in Patnitop are marked by a number of skiing courses and setups coming up in the area. Given the modest and gentle slopes in Patnitop, it tends to be an ideal destination for skiing for people with no prior experience. Madha Top (5-6 kms from Patnitop on the Sanasar Road) has good possibilities for all levels of skiing. Located in Kud, this park is famous for its beautiful flowers. The park is a comfortable place for couples as well as families and has become a favorite picnic spot to everyone who visit Kud. One of the main attractions in the region is 'Patisa', a sweet that the place is known for. it comes on the way to Patnitop from Jammu on the Udhampur Srinagar Highway. The Nag (Cobra) Temple near Patnitop is more than 600 years old. During the Nag Panchami Festival, it sees hundreds of Shiva devotees, who throng to this temple to pay respects and worship the snake King Cobra. Predominantly made of wood, this temple has weathered several centuries although it is not a conventional solid temple construction. Standing amidst lush green surroundings, the temple is not only a significant religious center for the area, but also a site which leaves its visitors fascinated by the sceneries around. A staircase of 270 steps chiseled out of the mountain, a little away from Patnitop is known by the name of Billoo ki Powri and falls in the town of Dawariyai. Its origin remain untraced, though it often finds itself being referred to as a shorter way to Batote town, constructed by the former king of Chenani. Situated at an altitude of 2,024 m, Madhatop is easily accessible by road and is a 5 km trek away from Patnitop. Surrounded by pristine natural beauty, Madhatop is a great getaway destination for trekkers, honeymooners, winter sport aficionados and pretty much everyone else in between. Madhatop, with its salubrious climes and silver mountains is almost a haven for honeymooners and adventure tourists. Patnitop is a small city in Jammu and Kashmir and is a well-known hill station of the state. It is a beautiful city and is very famous for its street shopping. It is popular for its dry fruits, Kashmiri handicrafts, and Pashmina shawls. The sweets here too have a unique taste and should definitely not be missed out on. 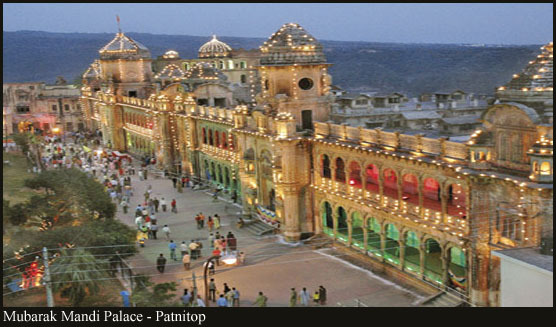 One can purchase local souvenirs and handicraft near the Naag Temple in Patnitop. Since the Naag Temple is ancient, one can easily find souvenirs here belonging to ancient times. There are various spots in Patnitop where one can sit and enjoy a good meal at a nominal price. Some of these hogging joints include Bistro restaurant, Hotel Shivalik and Vaishno Dhaba situated near the Patnitop taxi stand. There is also a small liquor shop wherein all sorts of beverages are available. The specialty items are not at all costly; they are totally worth their cost. One can easily look for clothes, footwear, etc. for all age members of the family. Pandora Enclave is the one and only best shopping spot in Patnitop where one can find the best quality Pashminas. Built almost 80 years ago, this temple was built on the spot where a Shiva devotee was accidentally killed by his trishul, while he was trying to protect his consort, Parvati. Lying at an altitude of around 3500m, and a 11km trek from Patnitop, Shiva Ghar makes for an exciting one day trek. Trekking equipments can be hired from the tourist department shops in Jammu. Nature trails can lead to pockets where time stands still and calm prevails. Encounter breathtaking landscapes and indulge in scenic purity on nature walks through the landscapes, hills and valleys here.